PRICE REDUCED! 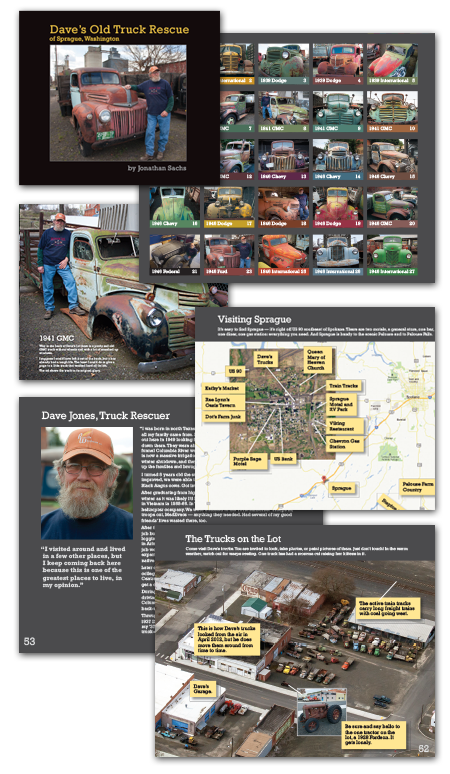 This 8" x 9.5" softcover book contains photos of 45 of Dave's trucks, along with aerial views of the trucks and town of Sprague. Also meet Dave in two pages of interviews. Some pages include Dave's stories about the trucks, some include the original manufacturers' ads for the truck. The book is 60 pages, with a matte black cover and extra glossy photo on the cover. Each copy comes signed by me, Jon Sachs, the photographer. Dave Jones saved a group of over 60 trucks from being sold for scrap metal. He bought them and put them out in public for anyone to come and see. Over time the old trucks have started to attract fans, who exit off Interstate 90 to see them. Dave makes no money from the trucks; in fact they cost him money to buy and store. He just can't stand to see them go to the crusher. I stumbled onto them and decided I had to make a book about Dave and the trucks — this is that book.